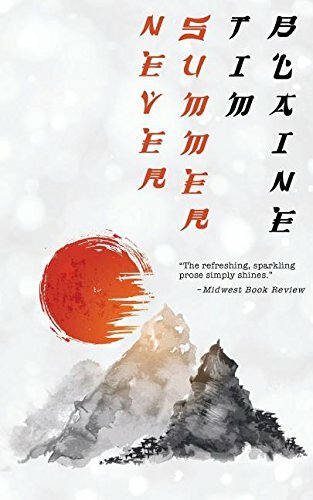 “Never Summer” by Tim Blaine was quite an interesting read in that it was a different type of story for me. After a long stay in Japan, Vlad D’Agnosino learns he has tuberculosis, and finds himself in New York City seeking the help of a doctor in Colorado, who feels the mountain air will help him. Vlad, knowing that eventually the consumption will end his life, chooses to at least see how it works. As Vlad begins to learn more about the treatment and how it will impact him, he meets a variety of individuals who add their thoughts. Vlad is a very unusual man and finds he is at odds with his family, and actions that have impacted his life. I found the story interesting in that the main character is seeking many answers in his life about his past and future, and rather than just wait to die he must make choices about living in the present. Blaine provides an excellent read, which has a great philosophical view and is filled with corruption, brothels, and gang threats. I find it interesting Madame LaGrange protects the women who work for her, and at the same time, she is funding the sheriff who many believe to be corrupt. Easy to read, compelling, and covers many areas, it was interesting to see the many lives impacted by what has happened in the past, and some must suffer for it. Blaine’s writing is eastern philosophy combined with western action. There are very few authors that can connect this type of story that keeps reader's interest. Many individuals with a deadly illness attempt to make right from all their wrongs. Sometimes it works, and sometimes it doesn't. I like the fact that Blaine had his main character choose not to focus on his past, but to live life as he should and accept that no one should be harmed by those who use them. If you like a read that has a good flow, with relatable characters that cause you to try to determine what you would do in situations like those Vlad encountered, you will love “Never Summer” by Tim Blaine.